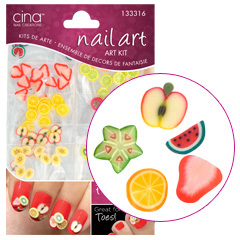 I'm not normally into nail art but when I saw these cute Fruit Salad decorations from Cina Nail Art (available at Sally's Express), I thought I'd give it a go. I'd also consider these for summer toes. Within the pack, you get 10 of each fruit which gives the option of mixing & matching or choosing to apply each nail with the same fruit. The fruits are adorable- teeny watermelon, kiwi, apple, citrus, starfruit and strawberry slices. I painted my nails in the usual way- base coat to prevent staining followed by the suitably bright OPI Cajun Shrimp and waited for them to dry. I initially thought the decorations would be applied to wet polish but upon reading the instructions, this isn't the case. I played around with the various decorations- leaving some nails plain, placing one decoration or doubling up. Although tiny and fiddly, the decorations were easier than I expected to use. I rested my hand on a flat surface, placed the decoration onto my nail, slathered on Seche Vite top coat and then repositioned using the provided orange stick, gently pressing around the edges. I was impressed with how well the effects lasted- I only had to remove once my nails were showing signs of tip wear & even then, the decorations remained quite secure & only budged after some vigourous rubbing with nail polish remover. If you're looking for a fun way to experiment with nail art for the summer, I'd highly recommend these.